The Article: Jimmy Carter May Actually Be Right This Time in Forbes. 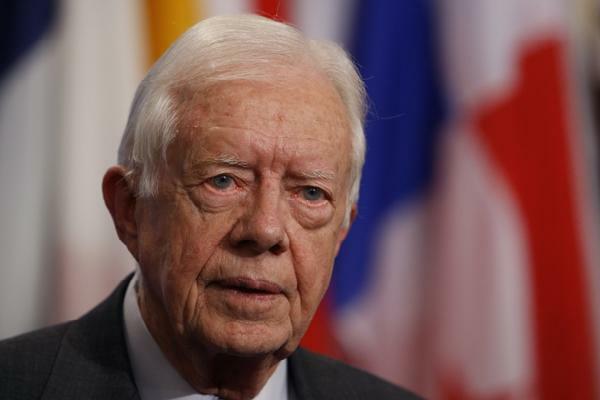 The Text: Former President Jimmy Carter, who in certain circles is often accused of being downright anti-American – not to mention anti-Israel – told a gathering of the Atlantic Bridge in Atlanta this week that the United States no longer has a functioning democracy. I’m sure Republicans hearing the news were aghast at the remark and his additional comments defending NSA leaker and traitor Edward Snowden stating he is providing everyone with “beneficial” information and not in the least the criminal some would suggest. Carter routinely demonstrates through his public comments why his was a failed Presidency. To this very day, he shows how outside of the mainstream he is on a range of issues. Sounds like another Nobel Prize winner I hear opining out there, but I digress. I could very easily criticize Carter for his comments as I have little use for activist former Presidents who make a living criticizing the nation they once were given the honor to serve. But in this instance, I think Carter is making a point that is important for all of us. Our democratic process is buckling. Our Republic is weakening. Contrary to Carter’s point, though it’s not the NSA’s fault or that of the U.S. intelligence community. It’s also not the fault of a government desperately trying to balance fighting enemies both foreign and domestic who are employing rapidly-changing technology to perfect their craft. For the conservatives out there, it’s not the fault of Obamacare or immigration proposals or the buttressing by Progressives of the entitlement state. Every day we must remember that the vitality of our democratic system depends on us – Americans’ active engagement – and our faith that when we engage can have an impact. Our government was founded on the principle that people would participate in the selection and accountability of their government officials. Today, however, from school board elections in the suburbs to choosing the mayors of our nation’s largest cities to the American Presidency, voter participation rates show that Americans are disengaging from the system. Consider that newly-minted mayor of Los Angeles, Eric Garcetti, won city hall in an election where turnout was only 17%. In New York City, 7 in 10 registered voters stayed home for Mike Bloomberg ’s 2009 reelection. Elections for local school boards, which have a dramatic impact on property taxes, cost of living and the future of our young people, often hover in the teens. There are hundreds of dismal examples, each carrying with it a message about how and why our government has gone off the rails. We’ve allowed it to happen. The Electoral College today disenfranchises millions of voters and has the effect of driving our turnout numbers down in Presidential election years. Reform of that system should be a priority. But it was always our local elections where Jefferson and others believed that the democratic process really could flourish. We’ve drifted from Jeffersonian Democracy in a distressing way. Where Thomas Jefferson’s concept of civic engagement was inclusive and sought to protect against the rise of aristocracy and therefore disenfranchisement and corruption. It sought to instill power and confidence in the system with the people. What has developed is eroding the fabric of our participatory system. Our inaction and apathy has led to the creation of the very aristocracy Jefferson and the Founders sought to guard against. Our political class in this country enjoys an 85-90% reelection rate while voter confidence in government has plummeted to the worst level in half a century. Stagnation produces a Congress less popular head-to-head than colonoscopies and used car salesmen, according to a 2013 Public Policy Poll. Those permanent incumbents who serve ten, twenty or thirty year careers in elected office create political fiefdoms that assure they will over time be accountable to fewer and fewer voters. The political class also works to insulate itself by manipulating the apparatus of government. Crony capitalism didn’t just spring from thin air. It is part of a culture of self-dealing that leads to corruption, taxpayer abuse and the stunting of personal and economic freedom at every level of government. The ‘two Americas’ isn’t about the rich and poor as the Progressive PGR -0.96% left would have you believe. It’s between the political class and everyone else who live under the thumb of the money, special interests and legal bribery that predetermines election outcomes in too many places to sustain a sense of confidence in the system. Going back to the days of the fight between the Federalists and Anti-Federalists, our system is also based on a natural tension in American political discourse. People are supposed to have and express different views and philosophies. It’s when we become ruled by one party or driven by largely one political philosophy that our democratic system is imperiled. Ask the voters of California, New York, and Illinois how one-party dominance and squishy oppositions have impacted their states. Arguably, in addition to voter apathy and a political class that is stronger for it, we also are losing that critical tension. The political class has varying tonality on the issues, but they are largely singing from the same sheet of music. We have built layers of government in the last two hundred and thirty years. Those layers of government have grown to an unsustainable cost and scope. The breakdown in the system occurs when the bold policy changes necessary to address inefficiencies and overreach either persistently make the situation worse or nibble around the edges for fear of backlash against the political class. That ensures the fiscal crisis and freedom crisis in America are never truly addressed. It ensures people will value their right to vote and participate in the system even less. The public isn’t stupid. With the exception of the Progressive left, both Democrats and Republicans to one degree or another acknowledge the existence of many of the same problems we face in America, but neither has the force, genuine desire or ability to back us off the cliff. Voters know their government is clueless and disconnected. What they often seem to forget is that it’s up to us to make it work. That brings us back to Carter’s point. The question must be called – Can you have a functioning democracy with a real voter participation rate of around 25% and a elite political class that refuses to protect freedom and opportunity? The answer is no. It’s up to everyone to take ownership of our democratic process with increased civic participation starting at the local level. Turn off Fox News and start reading the local paper again. Don’t glue yourself to CNN and attend a town board meeting. Unless we do that, personal and economic freedom will continue to falter and Jimmy Carter will be proven right. We would never want either to be the case.